A small bronze stem cup with a deeply rounded body, supported on a trumpet shaped foot with knotted stem. The cup has a flared rim with a single high relief ‘bowstring’ band around the body just below it. The bronze has acquired a malachite and cuprite patina, leaving most of the original metal surface intact and visible. The Tang dynasty was a period of exchanges with foreign territories and as a result vessels and works of art in shapes different to what had hitherto been known were entering China from the West. This charming little cup is one such example, its elegant shape is seen not only in other metals such as silver and gold, but also in ceramic. Two comparable stoneware cups of the same shape are in the collection of the Victoria and Albert Museum, London: one is covered in a grey-green glaze and dated to the Sui dynasty (581 – 618), the other has a white glaze and is dated to the Tang dynasty. The present stem cup is the type of unadorned, functional bronze vessel that belongs to a group that includes bottles, cups and bowls, which appear to have been used mostly by Buddhist monks in rituals. Several such cups were included in the 1999 exhibition Tin-Bronze of China at the Kuboso Memorial Museum of Art in Izumi. 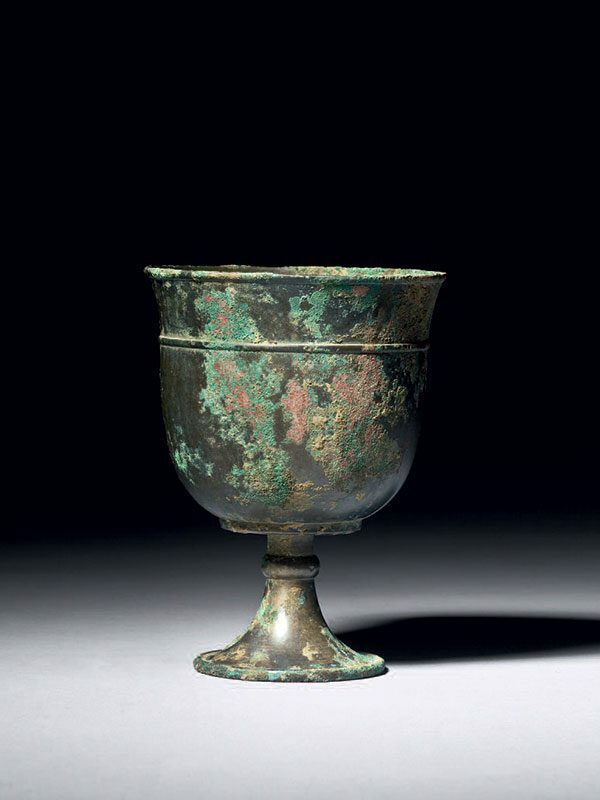 A miniature cup of identical form, formerly in the collection of George Eumorfopoulos, is now in the British Museum.